Feb. 15, 2019 – It’s back to warmer, rainy conditions in the region for Friday, with a reminder to our students, parents and guardians to use caution while traveling to and from school. All New Westminster Schools continue to be open. Please see our school procedures for inclement weather below. Our maintenance crew have worked tirelessly to keep parking lots and walkways clear, and our schools and properties safe during this period of record-breaking snowfall for February. In preparation for the possibility of severe weather conditions, we would like to remind parents/guardians that all schools in the New Westminster School District will remain OPEN, if at all possible, during inclement weather, including snowfalls. 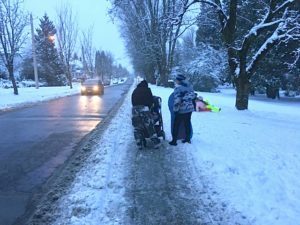 In rare instances where a school closure is warranted, the decision will be made by 6:30 a.m. at the latest and will be announced over the radio stations CKNW AM 980 and CBC AM 690. Phone calls and emails will also be made to parents and guardians who are part of our School Messenger System. Further, school and district websites will be updated accordingly. Student safety is our priority and we ask that if a parent/guardian feels that a child cannot travel safely to school then they should make alternate arrangements for their child. Student absences due to unsafe travel to school during inclement weather conditions will be excused. We also encourage parents/guardians to make advance alternate plans in the event of an unexpected school closure. If you have any questions, please speak with your school principal.